As I was cycling within the mystical grounds of Sukothai, the ancient Siam Kingdom, I could feel the tropical sun’s intensity peaking early. Setting my bicycle aside, I found the shade from a bodhi tree provided that perfect respite in which to relax and reflect upon life. I also took comfort from the accompanying statue of Buddha and his serene smile that so calmly embraced the world around me. Finding clear vision or as defined here as objectivity is a very satisfying discovery, much like finding that key piece to a puzzle you’ve been working on forever, especially if the puzzle is a rendition of an M.C.Escher painting. My recent Southeast Asia travel experience, has as with every world travel experience of mine, provided me with another enriching, incremental step toward self-discovery and an increased awareness of one’s place in the world. There’s a popular phrase I’ve heard and seen on T-shirts in numerous South American and Asian marketplaces that goes “same, same, only different”. This whimsical seemingly nonsensical phrase may carry greater wisdom than first observed. There’s a fascinating new scientific field which involves the study of fractal formations. Fractals are often defined as self-similarity. Self-similarity in Nature can be defined as the repetition of a unit pattern on different size scales or, stated another way, having parts that resemble the whole. A tree, representing the whole, with its individual parts; root system, branches and leaves, is a classic self-similarity example. A great gift that can be revealed through world travels is the gift of objectivity. Once I’m physically removed from my normal daily rituals, tasks, routines and influences, coupled by my swift adaptability to new surroundings, my mind becomes unencumbered, able to transcend and observe life objectively. As a world traveler and having concluded my fifty-fourth country visit, in Cambodia, I’m observing numerous repetitive patterns in mankind’s habits and behaviors as well. It’s deja vu all over again! These fractal patterns happen everywhere, no matter how diverse the societies may appear; whether in Ecuador, Nepal, Poland, or Vietnam, each society sharing common humanity and topographical traits. For example, I’ll be sitting on a bus, gazing out the window looking at the Cambodian countryside, and I’ll suddenly notice my travel experiences merging, folding and unfolding within my memory with the passing scenes: rural Cambodia, with its bucolic landscapes and impoverished family compounds; food- preparing mothers, structure-building fathers, laughing kids, and roaming, sleepy farm animals, will merge in my mind with similar scenes found in rural Nepal, Ecuador, Poland and Vietnam. The landscapes alter, some lush, some dry, depending on the season. Fields yield to hills which yield to mountains which yield back to fields again. The passing harvests with the workers in the fields vary slightly, crops ranging from rice to coffee beans to wheat, most work still conducted by manual labor. Divided only by languages, these cultures conduct similar tasks simultaneously throughout the world, yesterday, today and tomorrow: birth, childhood, adulthood, marriage, kids, family, death, rebirth, as certain as the sunrise each and every morning. A similar transcendental moment occurred while I was riding a hot, slow-moving train through the rural Czech Republic countryside. Across from my seat, I’d see the passengers’ faces slowly transform with each half conscious sleepy nod of my head as passengers arrive and depart with each incremental train station stop. I would glance up and find sitting across from me a talkative pair of students who would suddenly transform into a quiet, tired-looking middle-aged working couple who, after another nod, would transform into a fragile, forlorn-looking elderly couple. Were they different people or the same couple seen through the years on the same train? Travelers too exhibit repeating patterns and routines. The routines will vary depending on the types of individual that travel. They may be routines that make us feel comfortable, make us feel safe, or make us feel alive. Kindred spirits will intersect on the travelers’ road more often than unlike souls. As independent and individualistic as I am my recent Southeast Asia travels during the winter months will still be closely repeated and experienced by another person in the succeeding two months or the same winter months next year. Years later, I may meet that same person in a coffee shop, this recognition perhaps only acknowledged by a friendly nod or smile. Are our two holographic universe intersections a part of a thousand similar “chance” meetings taking place simultaneously in the world? These scenes of relative peace and contentment that societies exhibit sometimes get rudely interrupted by wars initiated by powerful greedy mad men who show evidence of similar sociopathic behaviors, inflicting pain upon the people they rule or manipulate until the people finally have had enough of them. One can simply study human history, whether in Europe, Asia, the Americas or Africa, and find these repetitive patterns. No surprise the symbol for mankind in the Hopi Indian mythology is a foolish character that the gods just smile at, shaking their heads in disbelief. Yet, while humankind may exhibit similar behavioral fractal patterns…certain individuals and cultures concurrently demonstrate unique characteristics as to how to deal with life patterns we can not avoid. 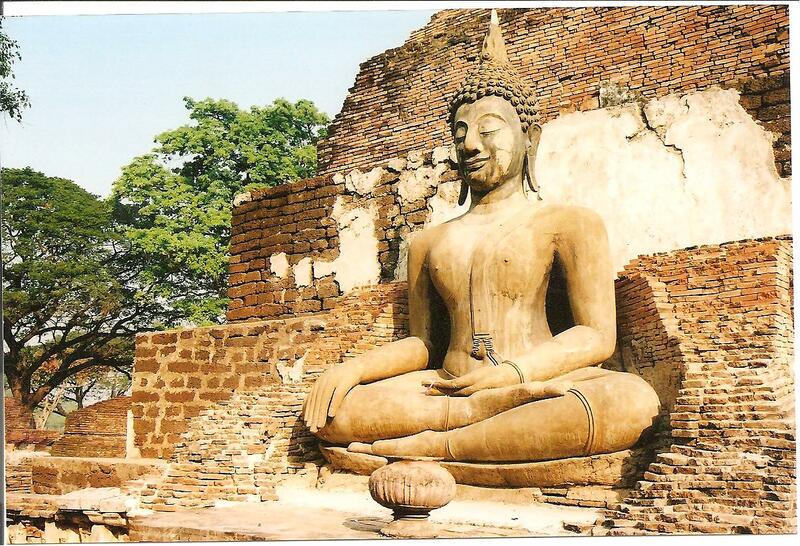 In Southeast Asia, whether in Thailand, Laos, Cambodia or Vietnam, the Buddhist philosophical /spiritual influence is strongly evident among the people, revealed through good healthy physical routines such as sunrise exercises, healthy nutritional diets and healthy mental attitudes. I was impressed by the average Thai or Vietnamese’s peaceful demeanor, consistent genuine kindness, friendliness and respectfulness for all living entities. Such kind behaviors and mental outlooks are not always as prevalent in other regions of the world. This distinction was so profoundly felt by one Canadian fellow I met that he was going to make a concerted effort to be friendlier to strangers when he returned home, a transference that could alter the fractal dynamics of humankind! Could one ask for a better example to the benefits of world travel. These words reminded me of a passage from one of my favorite books, The Zen Book, which summarized my feelings at that moment: “Happiness just IS. It isn’t something you have to earn, look for, or wait to receive- it’s always there. To find it, simply stop looking and become it.” Enough said. Also, please feel free to comment on this essay by clicking Add Comments/Feedback section located on far right side. Thanks! This entry was posted in philosophical, Travel and tagged adventure, asia, buddhist, budget, cambodia, fractal, laos, philosophy, southeast, thailand, travel, traveler, vietnam, writing. Bookmark the permalink. Hi, ur blog is really nice & informative, I truly like it. I just wanna suggest that u should submit your blog in this website which is offering very unique features at cheap prices there are expert advertising team who will promote ur blog & affiliate ads through all over the networks which will definitely boost ur traffic & readers. Finally I have bookmarked ur blog & also shared to my friends.i think my friend might too like it hope u have a wonderful day & ! !happy blogging!!. Fractal or genetic basis? Is the pattern a product of randomosity or common drives to all subsets of mankind? Hard to separate or verfiy either hypothesis. I love that quote, “Same, same , only different”. Maybe the world is shrinking into a one-size-fits-all? Thank you for sharing this very informative information. I think, being objective in approach is a good idea. It seems that youre finding the truth about this world. I really like this statement Years later, I may meet that same person in a coffee shop, this recognition perhaps only acknowledged by a friendly nod or smile. Are our two holographic universe intersections a part of a thousand similar chance meetings taking place simultaneously in the world?. It seems that there is something setting up the events for us. I think its destiny. that enriches the mind, heart, and soul. Awesome post! Can I tell you as a little gril how many boy bullies I beat up every school year? They annoyed me at how they picked on kids who were not mentally tough or physically able to defend themselves like kids with severe heart problems or the mentally challenged. It got so the teachers would disappear during recess when they saw me on the move to deal with them – and not before they wiped a smile off their face as they walked away. The tough thing is if we all don’t stand up to bullies and get serious about prosecuting this nasty behavior it will only get worse. It seems America has always had a bent for violent behavior. At some point we must enforce laws and social codes to rein in the worst of it, especially by Big Business. It does not help if people are anti-violence or anti-war yet are willing to be bullied into submission by the violent people. We must fight for what is right and sometimes it is a long hard fight. Excellent post and I sure enjoyed reading your thoughts! Thank you for addressing in such detail a systemic problem in America. Now send this post to every politician in Congress, the President, every world leader and school administrator. It’s time for a movement to rise up to effectively deal with this insanity bullying like the Mothers Against Drunk Driving (MADD) did to get drunk drivers off the road. I loved the post. I have had similar thoughts, but I have never been able to put things into words so well. Visiting far fewer countries than you have, I discovered that our similarities are far greater than our differences.Yet, it is our differences that get highlighted by those in power who lead us to war. I wish I can travel as much as you have. Keep up the good work. More traveling and interactions on the scale of individuals rather than governments may make this world a much more peaceful place. Thanks very much for the approving comments!